Democratic Sen. Kamala Harris (Calif.) has brought a number of former Hillary Clinton campaign veterans on board to work in her Washington, D.C., congressional office, according to its roster. 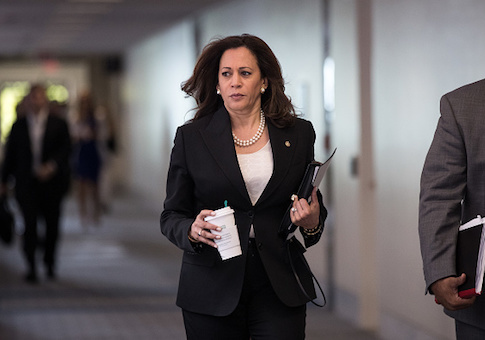 Harris has garnered media attention in recent weeks fueling speculation that she could be positioning herself to run in the Democratic primary during the 2020 presidential race. Harris reportedly mingled with former top donors to Hillary Clinton in the Hamptons this past weekend and will head back this upcoming weekend for a private meeting with Harvey Weinstein, a Hollywood liberal and longtime donor to Clinton, and his wife Georgina Chapman. The freshman senator is reported to have a separate dinner planned with Sen. Cory Booker (D., N.J.) and former Attorney General Eric Holder, whose group is working with former President Barack Obama on redistricting efforts. On Saturday, Harris will attend a reception with major liberal donor Charles E. Phillips, the CEO of Infor, a software company based in New York City. Harris has also added a number of former Clinton campaign veterans to her D.C. congressional office this year. Sergio Gonzales, a senior policy adviser to Harris, joined the senator's office in March. Prior to working with Harris, Gonzales was a regional director for Hillary for America. Lily Adams, who became Harris's communications director in January, was the deputy communications director at the Democratic National Committee (DNC) for two years before becoming the Iowa communication's director for the Clinton campaign in November 2015. Tyrone Gayle, a member of Clinton's communications team during the 2016 campaign, is now Harris's press secretary. Gayle was a regional communications director for Hillary for America from April 2015 to Nov. 2016. Another member of Clinton's communications team, Kate Waters, joined Harris's office in February as the senator's deputy press secretary. Waters worked as a deputy press secretary for Clinton's campaign during the Iowa caucus. For the West Virginia primary, Idaho primary, and Nebraska caucus, Waters served as press secretary for the campaign. Harris has also tapped former staff to President Obama. Zev Karlin-Neumann, a former National Security Council speechwriter at the White House from Nov. 2015 to Jan. 2017, is now Harris's speechwriter. Halie Soifer, Harris's national security adviser, worked as Obama's Florida Jewish vote director during the 2008 election. Soifer later became a senior policy adviser to Samantha Power, the former U.S. ambassador to the United Nations for President Obama. Harris has also spent big with the media firm responsible for elevating Sanders' profile during the primaries. The Democratic senator has disbursed more than $400,000 of her campaign funds to Revolution Messaging LLC this year, a D.C.-based progressive firm that built Sanders' digital and branding strategy. A majority of this money has gone towards advertisements. A Clinton donor who attended the Hamptons gathering this past weekend believes Harris will run for president. "She's running for president, take it to the bank," the donor told the Hill. "She's absolutely going to run." Harris and her staff have pushed back against this notion, saying that the senator is not thinking about running for president right now. Despite the event being widely reported, Harris's office claimed that the senator was not in New York this past weekend after being contacted by the Washington Free Beacon. When asked about the Hill‘s report, which quoted alleged donors at the event, the office did not respond. They also did not respond to questions on whether the senator will be there this upcoming weekend, as is being reported. The office did not provide comment on the former Clinton campaign vets on their staff.